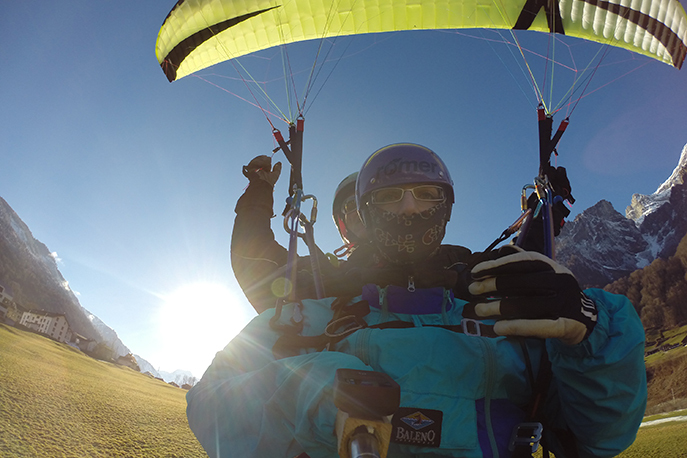 Fly as a passenger on the paraglider of a professional paragliding pilot. Take off and let yourself be seduced into the world of clouds and admire the magnificent mountain panorama. 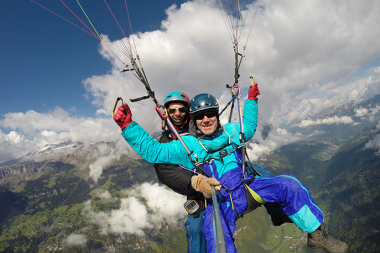 Fly as a passenger with a professional paraglider and enjoy a unique experience in his safe hands. A few running steps at the starting spot and up, up and away you go. Take off and let yourself be carried away into the realm of the clouds. 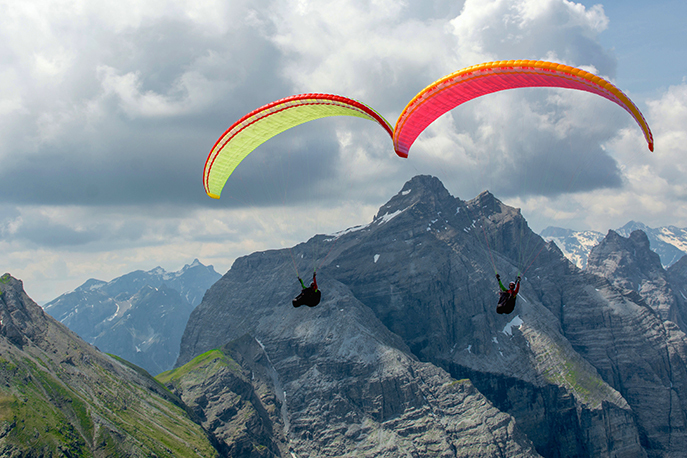 Feel the wind, enjoy the exhilarating sensation of height and savour the breathtaking panoramic mountain vista. Awaiting you is an unforgettable flight and the indescribable feeling of total freedom. No knowledge or experience of paragliding is required. All you require to be able to enjoy the experience of thermal soaring is a normal level of physical fitness. Equipped with a paraglider and all the necessary gear, your pilot will greet you at the meeting point and explain all the basics to you. Together you get the paraglider ready for take off and put on your harnesses. After just a few running steps the laws of aerodynamics ensure the perfect ascent. If you feel pretty comfortable on a chairlift, then you’ll have no problems paragliding. After all, during the flight you’re sitting in a comfortable paraglider seat and securely strapped in front of the pilot so there’s no need to worry about falling. Age does not play a role. Our youngest passenger was just 6 and our oldest was 80. All you have to be able to do is take a few running steps and jump from roughly the height of a chair. Our experienced pilots take care of all the rest and ensure you enjoy an exhilaratingly unforgettable flight and a gentle landing. Paragliding is subject to wind and weather and the flight can vary accordingly. Depending on the conditions you may experience a pleasant, calm gliding flight of around 10 to 15 minutes (more common in winter and in the morning) or the thrill of an upward flight which generally lasts longer (more common in the afternoon and between spring and autumn). Since only a small area is required for landing, numerous options are open. We generally land on fields where the passenger and the pilot, just like at the start, simply have to take a few running steps until the parachute behind them sinks onto the grass. Mountain lift tickets for the use of cable-car or chairlift to reach the starting point, transport of the group to and from the location. People who weigh less than 40 kg should fly in the morning. Why not spend a whole weekend in the Glarnerland region, e.g. in the Fronalpstock mountain lodge or in the village of Braunwald and enjoy the mountains from above and below? Sturdy footwear, warm clothing, jacket (suitable for the time of year). You can also take a camera or video camera with you, or your pilot can take photos or film using special equipment.